$15.95 per customizable candy jar. Cute little jar to hold little bits of candy or other tidbits. 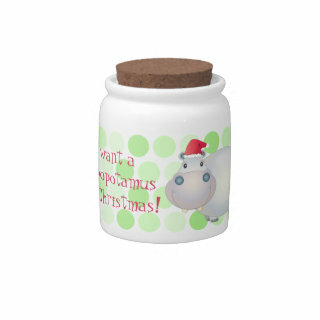 You can change the text on this red and green cute cartoon hippo Christmas candy jar. The fun hippo is wearing a red santa hat and is situated on green polka dots. The text says "I want a hippopotamus for Christmas!". Zazzle's 10oz mini candy jar is nice for small candies like jelly beans, paper clips and such (office desk supplies), coins, ribbons, small jewelry, tea, sugar, etc. Please note the size. These are small, cute candy or decorative jars. Makes a nice gift. This candy jar holds 10oz. Just a bit bigger than a pop can. Cork lid included. Zazzle candy jars are printed and shipped in the US, even if ordered off of international sites. Please allow sufficient time for international shipping.